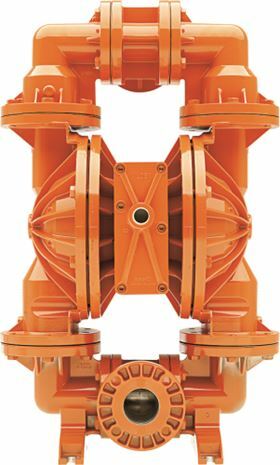 The pumps can be installed in an existing pump footprint without disturbing piping. The AODD pumps are currently available in the Advanced Series Metal 25mm (1 in) bolted stainless steel and aluminium, 38mm (1-1/2 in) bolted stainless steel, and 76mm (3 in) bolted stainless steel and aluminium models. Wilden drop-in style pumps have larger flow paths than the pump they are replacing, which can increase flow rates and decrease energy consumption. The bolted pumps include a variety of elastomer options, as well as the Pro-Flo X air distribution system which allows the pump user to control the flow rate and improve efficiency. Full-stroke PTFE diaphragms and DIN flanges are available for specific application requirements.